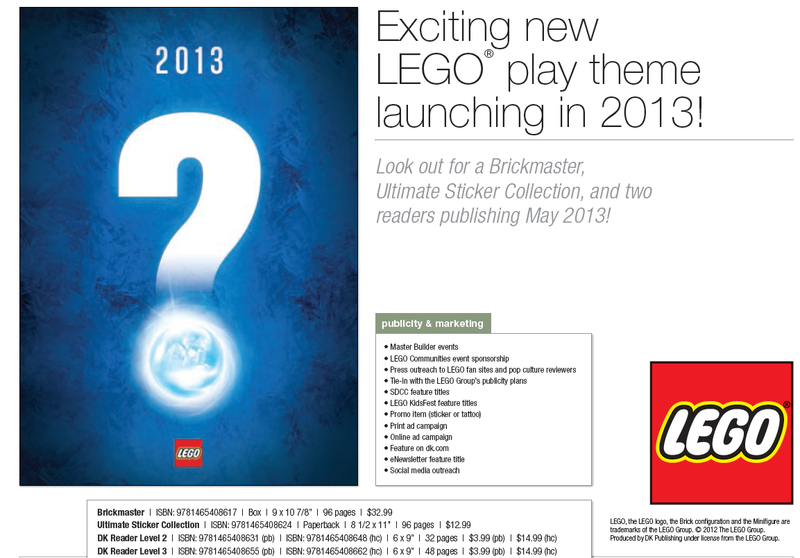 Smashing Bricks has uncovered some new LEGO books in the 2013 DK Catalog. 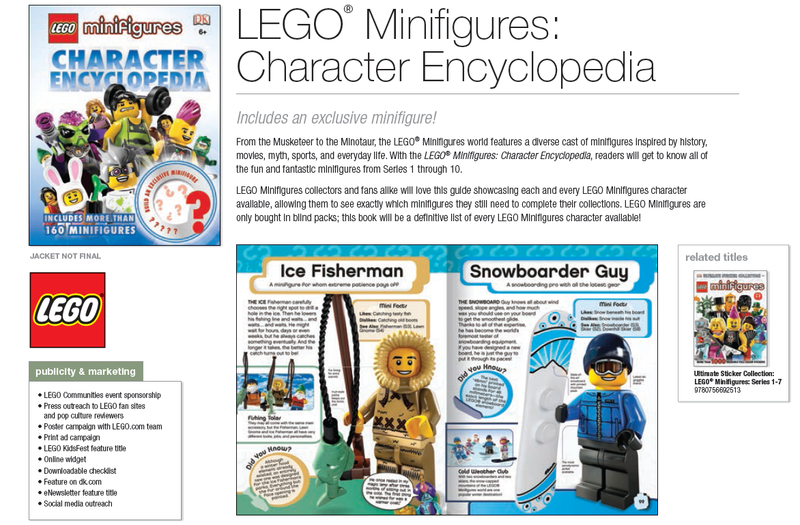 The first book we come across in the catalog is the LEGO Minifigures: Character Encyclopedia. 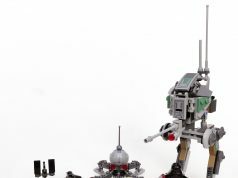 The book will feature all the minifigures from Series 1 through 10, and like with all LEGO encyclopedias, an exclusive minifigure will be included. It has 208 pages and retails at $18.99 and will be available May 2013. The next thing in the catalog we come to is the Legends of Chima theme. There will be a Brickmaster book 96 pages and retails for $32.99. There is also the Ultimate Sticker Collection which also has 96 pages and is priced at $12.99. Finally, there are 2 DK Readers which have 32 and 48 pages, $3.99 for paperback or $14.99 for hardcover. All the books are available May 2013. Two LEGO Star Wars DK Readers are next on the list, Attack of the Clones and Revenge of the Sith. 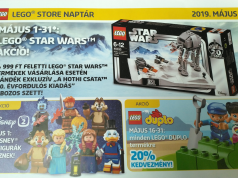 The books will be telling the story of Episode II and III in LEGO form. They are both available in August 2013. 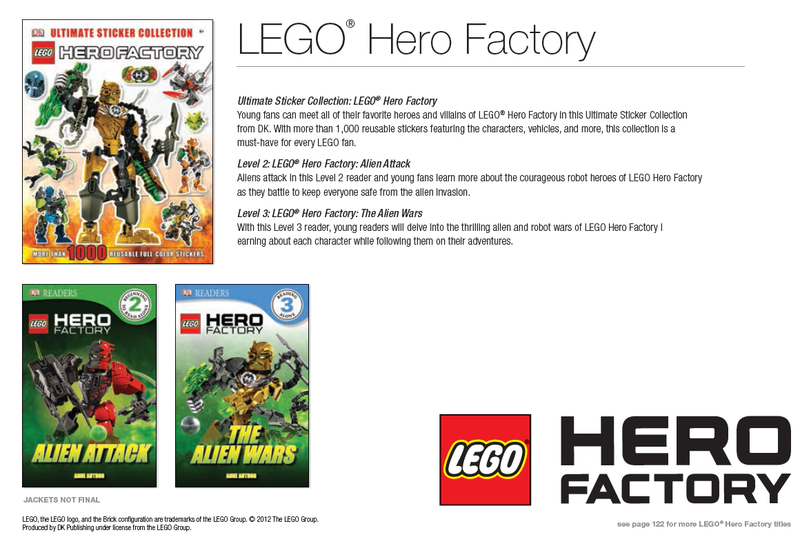 LEGO Hero Factory DB Books are also available in 2013. There will be an Ultimate Sticker Collection that has 96 pages and priced at $12.99 along with two DK Readers, Alien Attack (32 pages, $3.99 paperback, $14.99 hardcover) and The Alien Wars (48 pages, $3.99 paperback, $14.99 hardcover). These will be arriving in August 2013. 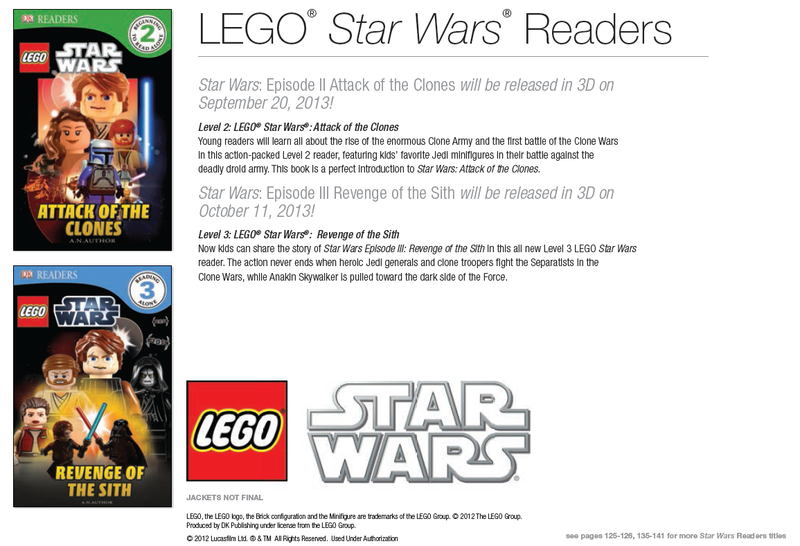 The last LEGO book to be featured in the DK catalog is LEGO Star Wars: Yoda Chronicles. We’ve seen a teaser of it in the November-December LEGO Club Magazine but now we have details on what the Yoda Chronicles is about. The book will be the first of many in the series detailing the story of Yoda and all his adventures. Plus, the book includes an exclusive minifigure. I’m going to go out on a limb and guess that it might be a Yoda minifig. The book has 64 pages and retails for $18.99. 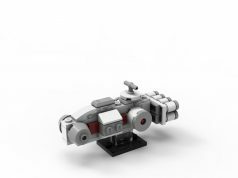 Relive Yoda’s adventures in the LEGO Star Wars galaxy with this all new format from DK. 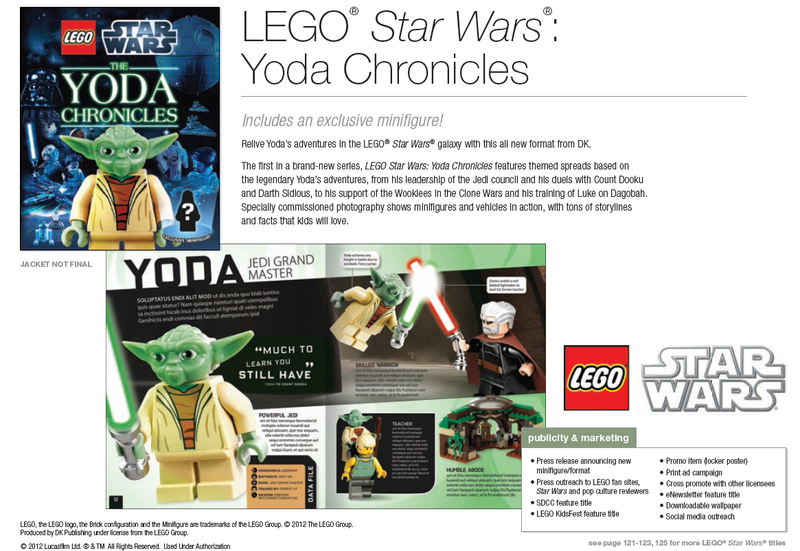 The first in a brand-new series, LEGO Star Wars: Yoda Chronicles features themed spreads based on the legendary Yoda’s adventures, from his leadership of the Jedi council and his duels with Count Dooku and Darth Sidious, to his support of the Wookiees in the Clone Wars and his training of Luke on Dagobah. Specially commissioned photography shows minifigures and vehicles in action, with tons of storylines and facts that kids will love.